A map of my hike, created with National Geographic Topo. I think the outline looks like a dinosaur. I got my Adirondack 46 on Dix! 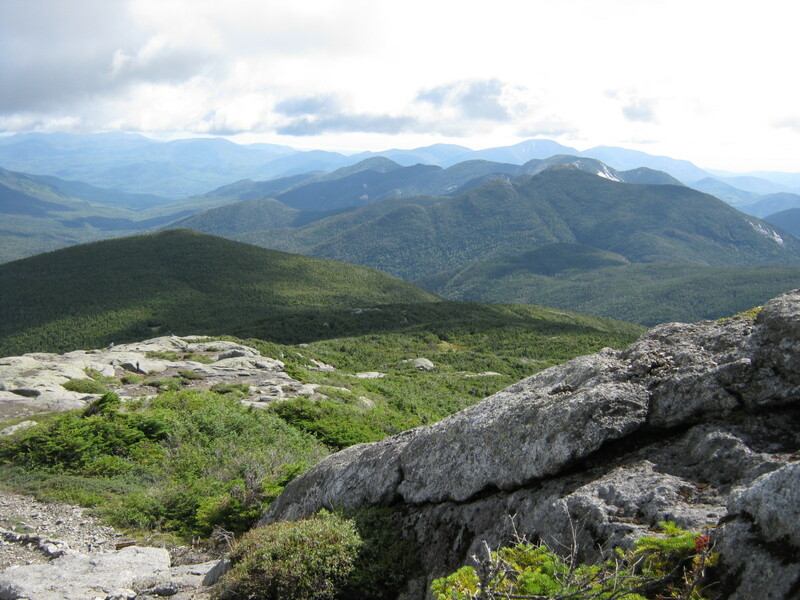 Over the years I've had fun in the Adirondack High Peaks, with torrential rain on Allen, knee-deep mud in the Sewards, and chest-deep snow in the Dixes. After a few years of long six-hour drives from Buffalo, I finally finished my Adirondack 46 after successfully completing the Gray-Dix Traverse. What? Yeah, the two peaks I had remaining were Gray and Dix (located in two separate mountain ranges) and I needed to find a way to link them. Sure, I could easily day hike either of them, but where is the fun in that? Would my final peaks come with a great challenge or would it be a simple walk in the woods? After studying my maps for months, I decided to finish in the most epic manner I could think of. 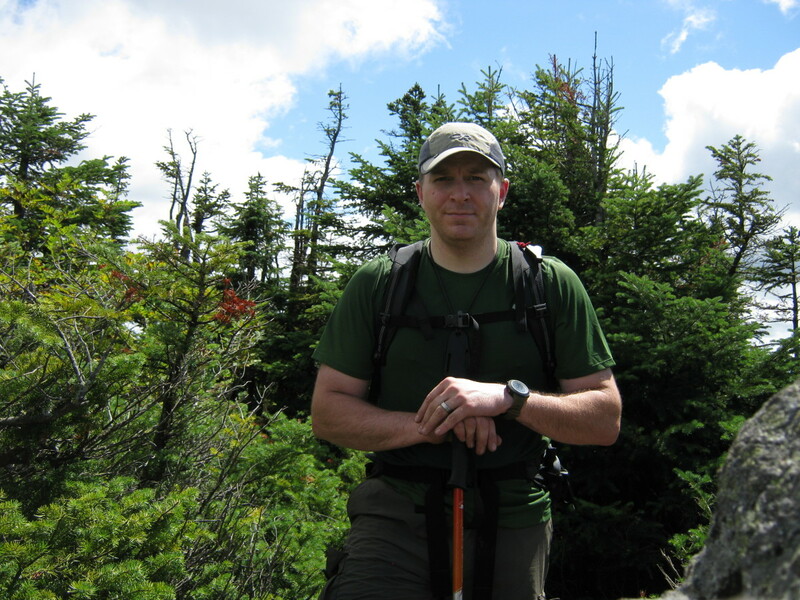 In August of 2011, I solo backpacked forty-two miles in three days over seven Adirondack High Peaks: Sawteeth, Gothics, Saddleback, Basin, Marcy, Gray, and Dix Mountains. Why Are There 46 High Peaks? Why 46? Aren't there more mountains that that in the Adirondacks? Yes, there are hundreds of mountains in the 'Dacks, but there are only a handful over the magical mark (in the northeast at least) over 4,000-feet. 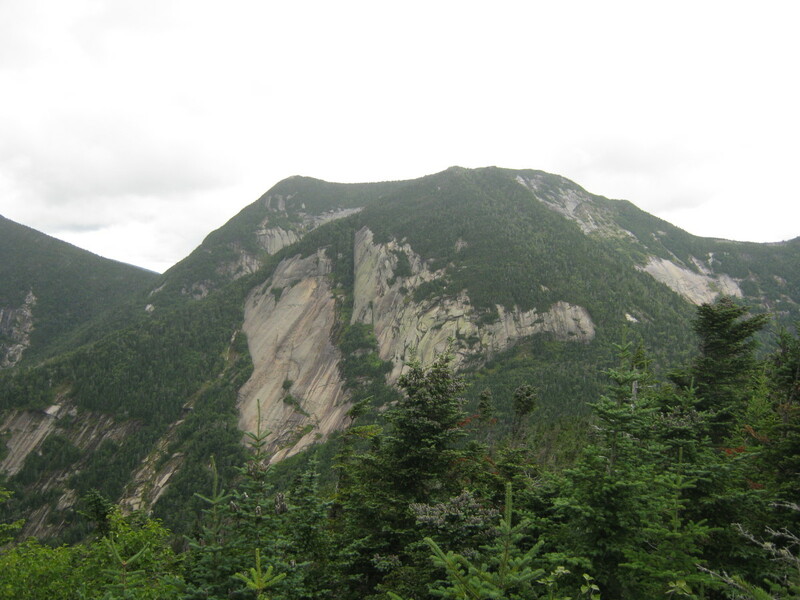 When Herbert Clark and the Marshall brothers started climbing the highest mountains in the Adirondacks, the geological data at the time stated there were 46 peaks over 4,000 feet. 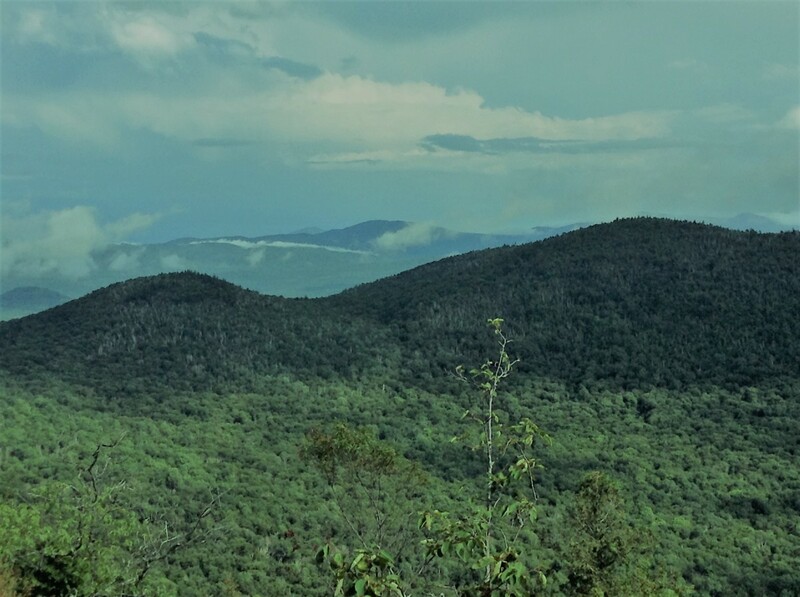 These mountains are clustered in the High Peak region near Lake Placid. Since then, four peaks have been measured slightly below 4,000, and MacNaughton Mountain is 4,000-feet even though it wasn't on the original list. Despite the variations in elevation readings, to be a 46er, you must climb the mountains on the original list. Oh, the things we do for patches. I started out from St. Huberts on a quest to finish my 46. It was supposed to be a sunny couple of days, but hazy mist shrouded my view as I walked through the darkness past great houses and down the Lake Road. Along the way, squirrels rustled in the leaves and the occasional deer would startle out of the woods. It seems I always see deer here. I reached the dam on the lower Ausable in great time, but the weather still hadn't cleared as I began climbing the Scenic Trail. I had never been up this trail before but had great views of Indian Head and Fish Hawk Cliffs. Along the way I passed several scenic outlooks, many of which are the perfect place for a picnic on a day hike to Sawteeth. In pure AMR fashion, the outlooks were numbered—supposedly for some sort of guided hike. Guided hikes are far too scripted for me as they take away some of the surprise of nature. After helping a bewildered hiker find her way, I reached the top of Sawteeth. I took my mandatory summit pictures and pushed on over Pyramid Peak toward the sheer cliffs of Gothics. Many agree that the ridge between Sawteeth and Gothics over Pyramid offers one of the most spectacular views in the Adirondack Park. Even though I've never hiked through there on a clear day, it is awesome to take in the majesty of the mountains even on a misty day. Climbing up the "elephant's trunk" as described by Barbara McMartin, I reached the open dome of Gothics. I sauntered over to the true summit so I could count this as another ascent. Though I count Haystack as my favorite, Gothics is a close second. 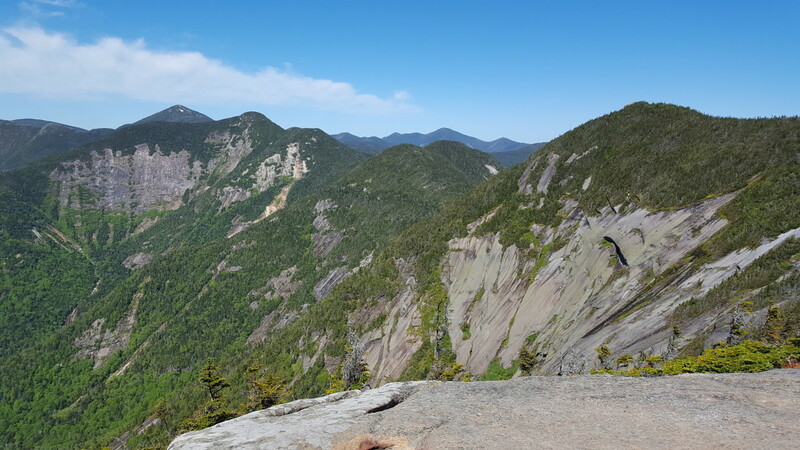 After descending Gothics' famous cable line, I looked ahead to Saddleback and Basin with some of the steepest and most rugged climbing in the High Peaks. I've done them a few times before and now my pack, at a scant eleven pounds, was lighter. 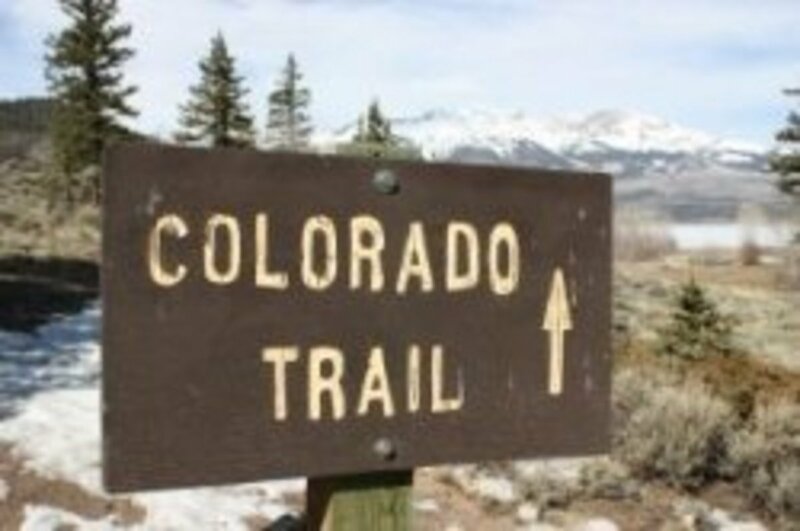 "The Range Trail between Saddleback and Basin is one of the most difficult in the Hight Peaks. 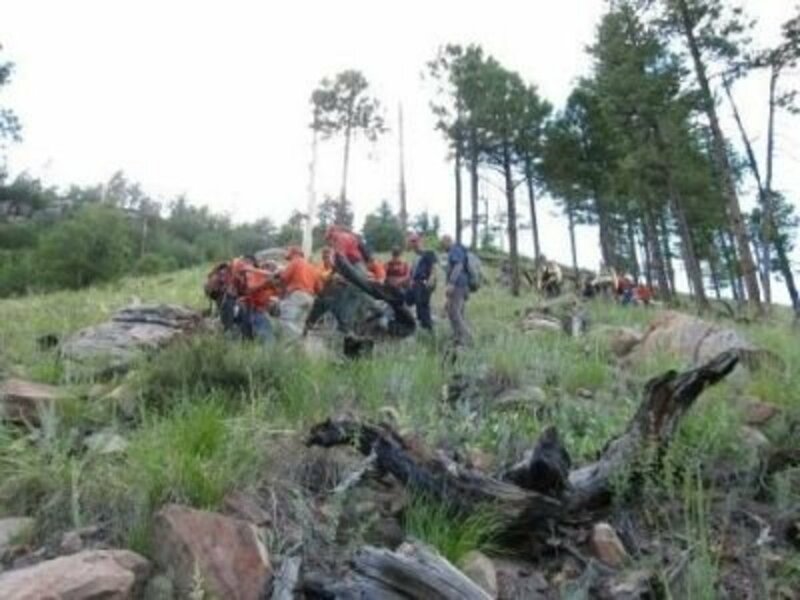 Extreme care is required in the initial 380-foot descent from Saddleback." 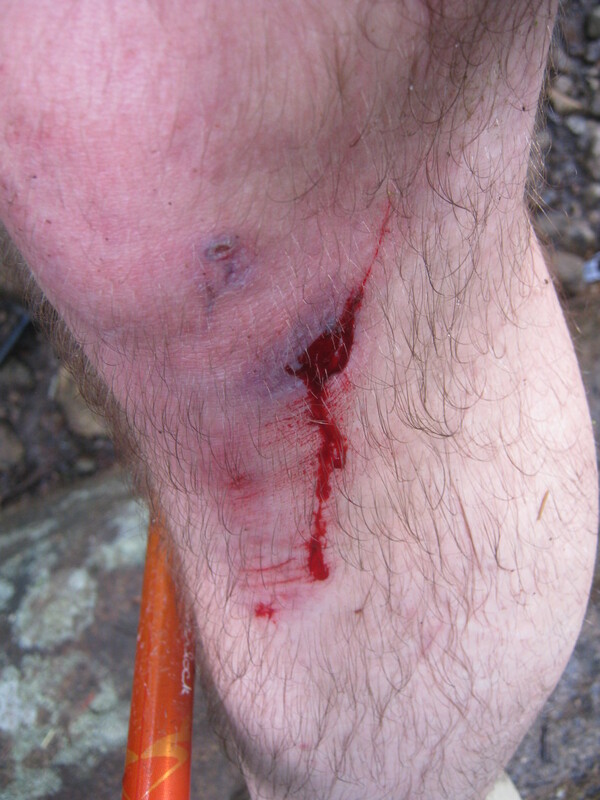 No backpacking trip to the Adirondacks is complete without drawing a little blood. It is my sacrifice to the gods of wilderness and something that must be spilled on this hallowed mountain range. 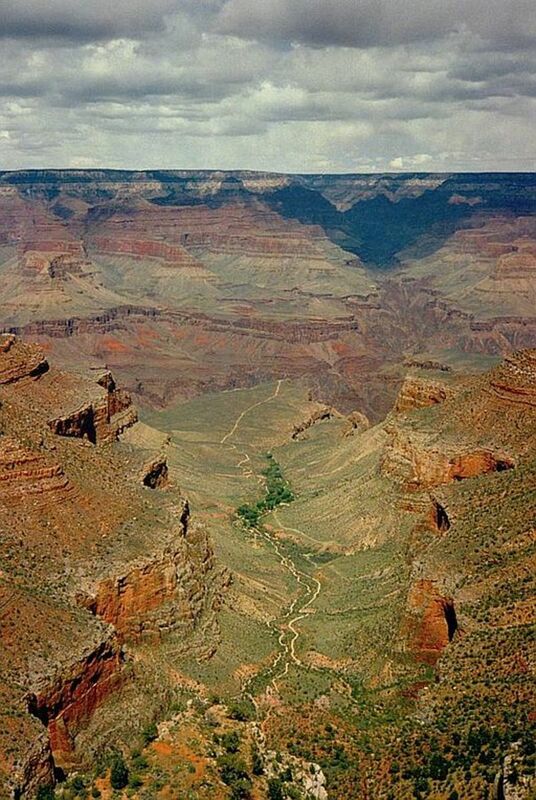 Anyone that has hiked the Great Range knows that it is more than a walk in the woods. You are scrambling, sliding, and smearing up and down rock faces. Many places you have no choice but to lower or raise your pack with a rope while easing yourself along the dangerous cliffs. A couple years back, I took a slide on Upper Wolfjaw. I ended up scraping the skin off my elbows and knees as I dug my body into the rock to stop from falling any further. I bandaged and duct taped myself as best I could that day and continued backpacking the rest of the range. It was one of the few times I ran out of medical supplies in my first aid kit. This time, it wasn't too bad though. As I descended Saddleback, I turned to grab a handhold and climb down a rather vertical spot. My foot slipped on the moistened rock, sending me for a short jolt. I swung my leg to grab hold of something, of anything—luckily I did. As I recovered from my almost-fall I looked down to see the blood oozing out from my knee. I must have hit it somehow. I placed some pressure on my wound and cleaned it up with some nearby antibacterial moss. I wrapped the bandana I wore on my neck around my knee and kept going. There was a storm coming and I still had to get over Basin before the rain really started. I'd take a break later and properly dress it- duct tape and all. A little bloody from my fall, I pushed up the trail toward Haystack and made camp at Snowbird. Or perhaps it is Snobird; I’ve seen it spelled both ways. Many people have never heard of it, but it is the place where the old Snowbird lean-to was removed nearly thirty years ago. The DEC removed the structure years before I even heard of the Adirondacks - I'll take the guidebook's word that it was there. The water from the nearby stream is always plentiful, even a couple of years ago in a particularly dry summer. I guess this is the third time I camped there while doing the Great Range traverse. Of course this was a night that I wished the lean-to was still there. As I arrived, the rain began to drizzle down and the wind howled through this high mountain pass. In order to save weight, I left my tarp in my car and just brought my Sierra Designs bivy sack. This was going to be one miserable night with the rain and that wind. Then I had a thought! 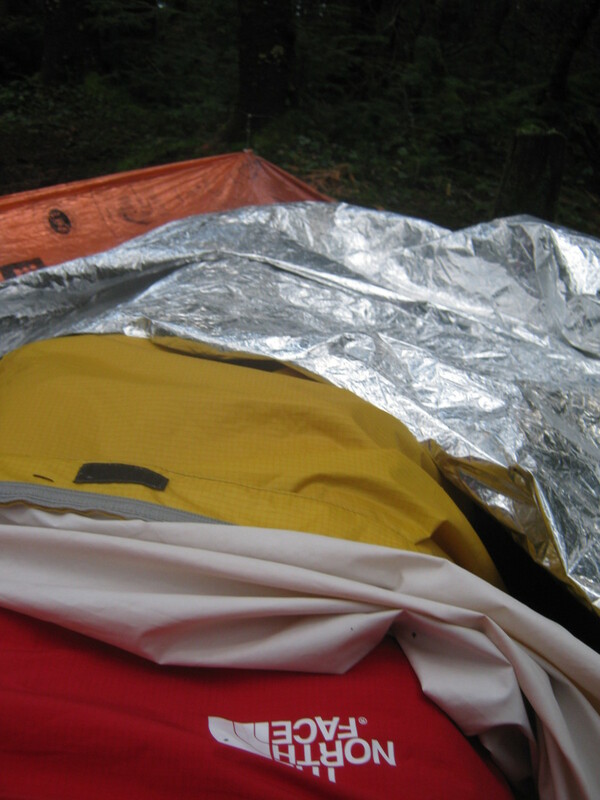 I carried a Heat Sheet mylar space blanket and I bet I could rig it up like a tarp. I stripped the "guts" from the parachute cord wrap around my neck knife's handle to use for multiple guy-out points. Using an old woodsman's trick (though I consider myself a young woodsman), I placed a small rock or pine cone in the tarp then wrapped my cord around it. That way I was able to make multiple grommets to tie this tarp down for the night. I pitched my makeshift tarp low and crawled underneath from the slightly higher leeward side. Starting to shiver a bit, I slid myself into my sleeping bag and bivy sack and then finally started to cook my supper out of reach of the cold Adirondack rain. I survived the night, staying dry and comfortable in the extremes of mountain weather. I awoke to a sunny morning at Snowbird and continued up the trail toward Mt Marcy. 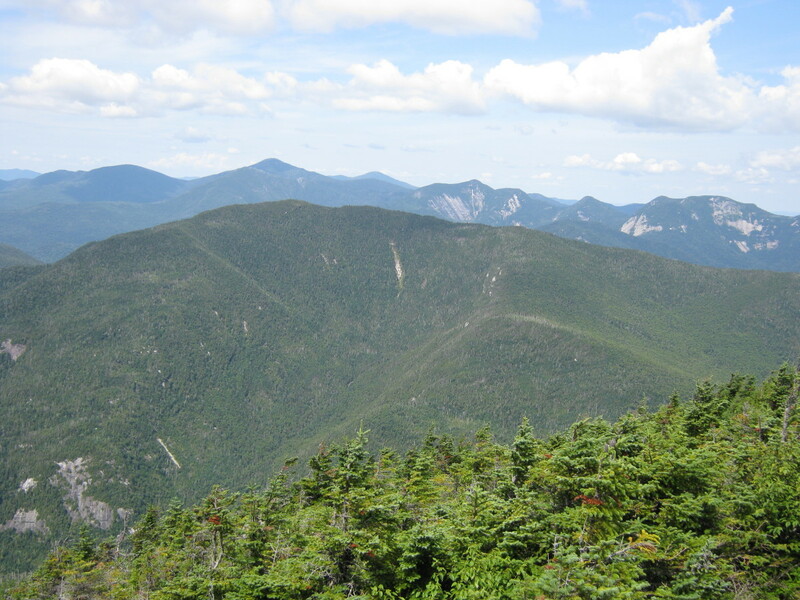 At 5,344 feet, Mt Marcy is the highest point in New York State and a destination in itself. I decided to pay homage to the Big Kahuna on the journey that would complete my Adirondack 46. I climbed Marcy earlier this year in June, only to be greeted with a blinding ice storm on top and winds that threatened to push me off the precipice. However, of all my previous climbs of Marcy, this was the best day by far on the summit. Usually I am in a cloud bank, but this time I could actually see. I spent quite a bit of time on Marcy, taking in the fantastic view and pointing out the landmarks to a few hikers that were new to the Adirondacks. After a short break at "Four Corners," I walked the ridge to Lake Tear of Clouds. 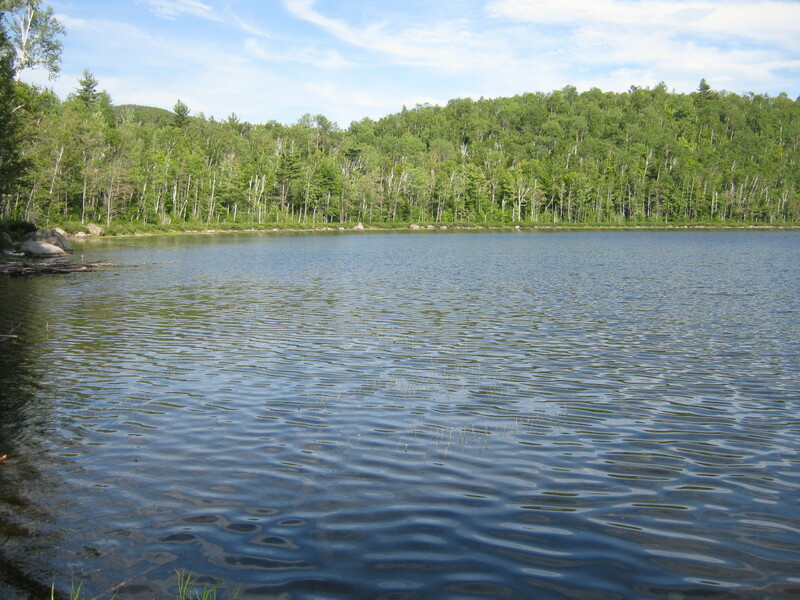 At 4,293-feet, this pristine little pond is the highest source of the Hudson River. I purified some water with my SteriPEN, grabbed a snack and headed up the Gray herd path (an unmarked trail) on the Western side of the pond. I've tried climbing Gray before, from Mt Marcy in the winter. I wandered about in a zero visibility snowstorm, crashing through drifts till I regained my senses and turned back. It was in the days before I carried a GPS. The 4,840-foot Gray peak is the seventh highest mountain in the Adirondacks and named for 19th century botanist Asa Gray. Though the summit is covered with short conifers, great views abound from a few spots that peek over the mountains. A couple behind me was bushwhacking directly to Marcy from the Gray summit. This would be the perfect day to go on such an adventure, but I already climbed that mountain today and I had many miles to go before I reached my camp at Elk Lake. After descending Gray, I returned to "Four Corners" and climbed down into Panther Gorge. 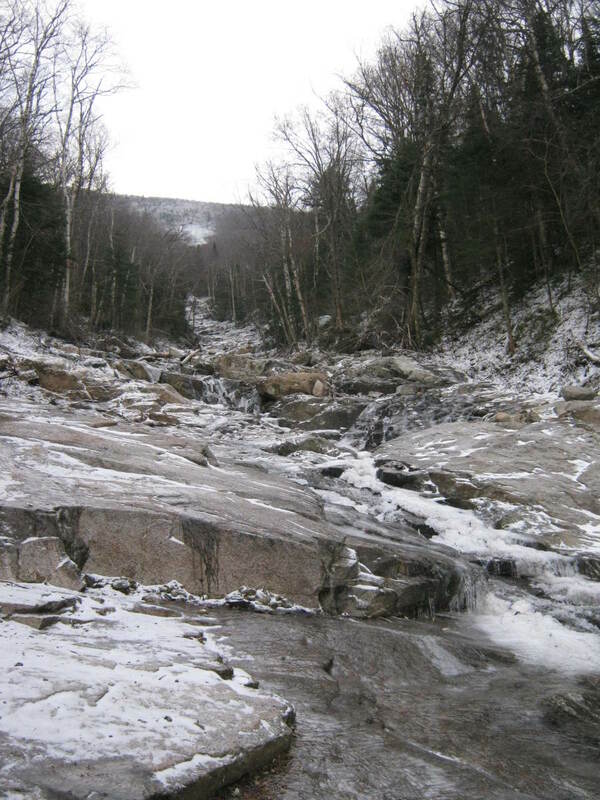 Panther Gorge is the steepest approach to Mt Marcy and the least used. I found the much-ignored trail pleasant and dry—surprising from the rain the previous night. I took a break at the Panther Gorge lean-to, refilled my water, and hiked toward Elk Lake. Though the trail does climb and descend, as all trails do, I found the trail altogether peaceful. It was the first time I ever walked this trail. I did he 10.2 miles from Four Corners to Elk Lake in solitude. Save for a backpack at the lean-to and a candy wrapper I picked up along the way, there were no signs of other hikers. It was just the way I liked it. Walking in the noisy silence of the woods awakens feelings that we ignore, both centering and inspiring us. As I drifted closer to Elk Lake, a beautiful lake kept hidden by private ownership, multiple side trails with "No Trespassing" came in to view. Yes, for around $190 a night you can hike on their trails and paddle in their lake - I was just passing through though. Just stay on the main trail and resist the urge to fight against private wilderness ownership and you'll be fine. I rounded the Elk Lake parking lot as dusk began to fall. Luckily I only had 2.3 miles to go before I reached Slide Brook lean-to. It was a sleepless night in a full lean-to at Slide Brook. Maybe I'd lost my ability to put up with other people's snores, or maybe I was just excited about reaching my goal. Excited? Well maybe a little more apprehensive. I signed in at the shelter register and spotted an entry from when I had stayed there a couple years back. That had been a solo winter trip, and my first foray into the Dix Range. I climbed up the Macomb slide, then snowshoed over to South and East Dix (Carson and Grace). I broke trail in the col between Macomb and South Dix, falling in multiple spruce traps and digging my way through unforgiving piles of snow. When I returned to the lean-to that night, it was the most welcome of sights on a cold January night. I delayed my departure that morning, hoping to have the trail to myself and my thoughts. Everyone else camping with me that night was far more ambitious, waking up early, and hiking all five peaks of the Dix Range. I just needed the one, however, and I needed enough energy to stumble back to my car that evening. I decided to climb Dix via the Beckhorn. The rocky protuberance to the South of Dix's summit was named by Ol' Mountain Phelps for the beak iron on an anvil—a reference now lost to many of us. It was fitting that Gray was number seven in order of height; Dix is number six at 4,857 feet. Named for John Adams Dix, a New York State governor, this peak stands above the other four mountains in this range. When I reached the pinnacle of Dix, there was a group of hikers on a nearby ledge basking in the sun and celebrating their own climb. I nodded my head in acknowledgment and began taking pictures of the summit marker and the surrounding mountains. I exchanged in the general hiking banter with the other hikers. "Where are you coming from?" "Where are you going?" Then one asked, "Which peak is this for you?" I paused for a moment, fully knowing the heft of my next few words, and said, "This is number forty-six..."
Quickly, they jumped up to the rock, shouting congratulatory messages, and began planning an impromptu ceremony for me. 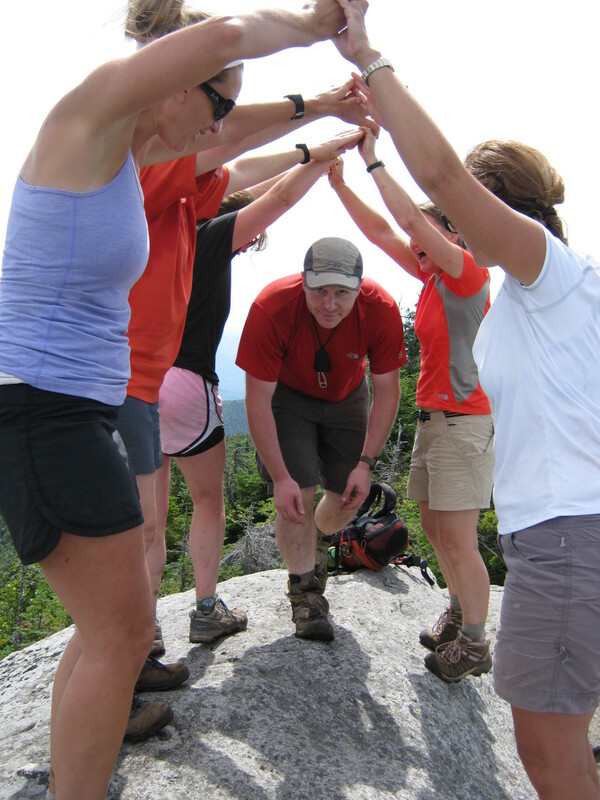 The group stood up and linked hands in an arch over the summit disk. I bent down and passed through this ring of complete strangers, all of whom were cheering me on. If you look at the picture, you'll notice how close some of them came to the edge while creating my ceremony. I don't know much about the group, except that they were from Vermont and that a couple of them were already 46ers. I'm sure I'll run into them again some day. I have climbed most of my peaks as a solo climber; I’m not used to seeing people on top of mountains, or people congratulating me. 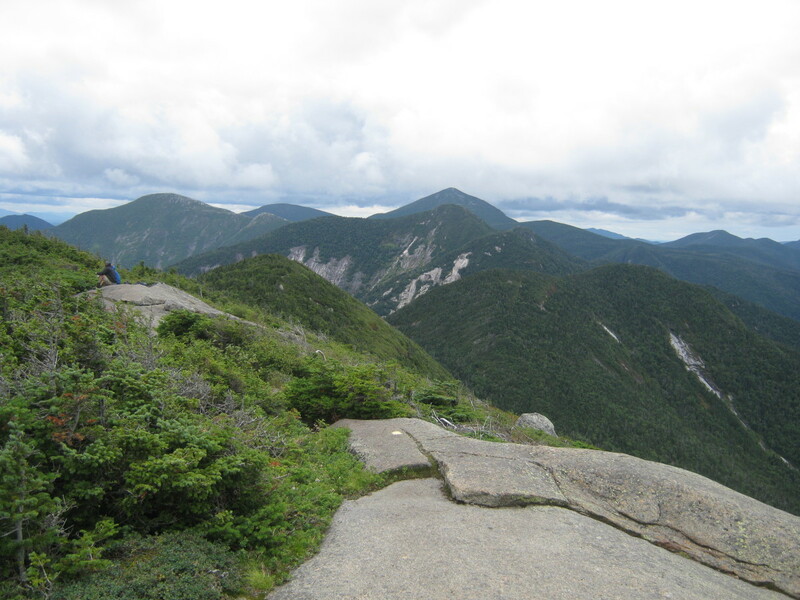 Have you hiked in the Adirondack High Peaks? 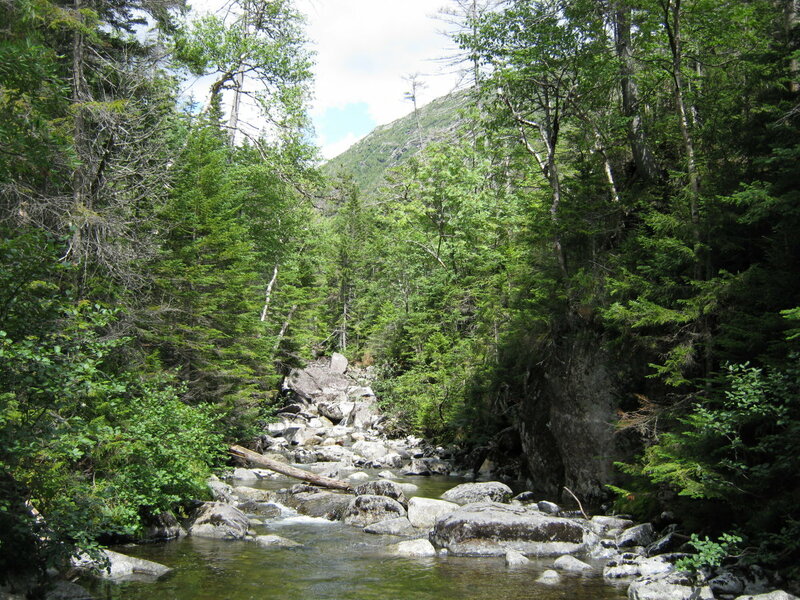 I climbed back down the other side of Dix and hiked toward Route 73 along the banks of the North Fork of the Boquet River. Within a tenth of a mile of passing the Boquet River lean-to, I saw a large black shape running through the woods in front of me. As everyone had their dogs out that day, at first glimpse I thought it was Fido, then realized it was a black bear. The bear, running south down the trail, saw me and turned quickly into the brush, passing silently out of sight. It seemed like the lord of the Adirondack forest swung by to congratulate me on my accomplishment. As all bears do, they like to run away before I can take a quick picture of them. They are the most uncooperative critters. Once I reached Route 73, the walk back became tiring. There is something unwelcoming about pavement under my feet. I looked to the mountains that guarded the mountain road and did my best not to stick my thumb out and hitch a ride back to the car. I did however, have a nice long foot soak in Chapel Pond. 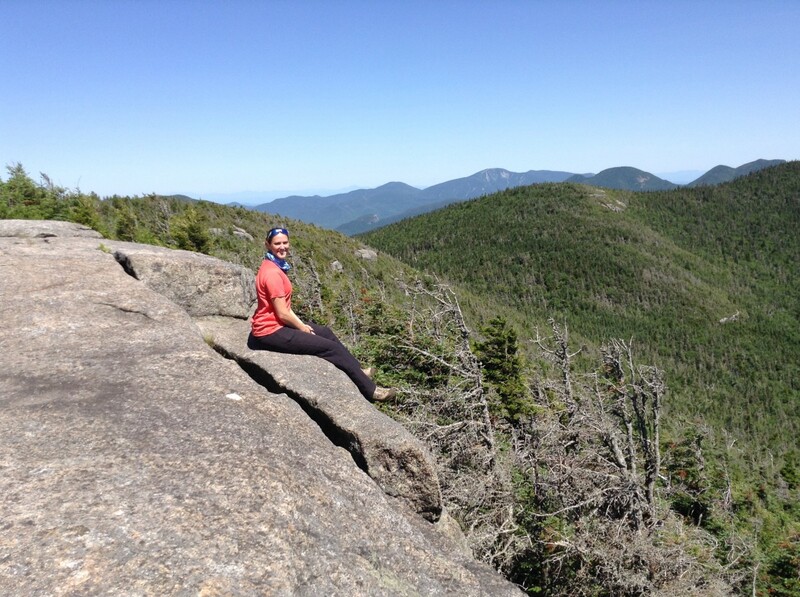 Though I finished hiking my Adirondack 46, it isn't like I am retiring from hiking in the Adirondacks. If anything, this feat makes me want to hike more and to finish subsequent rounds. If you have any questions or comments, please add them to the section below. I do my best to answer all questions. This is one of the most useful maps of the High Peaks that you can find. John's Brook Lodge (JBL) is a great place. Though, I've never stayed there, I've stopped by for a sampling of their home baked treats, water, and once to use their first aid kit. Short Job is a cool little mountain on a side trail on the way to Wolfjaw Col from JBL. I tend to be a rather reserved person, but the strange impromptu ceremony was a pleasing and unexpected surprise. Thanks for commenting pommefritte and for volunteering to maintain trails. Great story Outbound! Congratulations on becoming a 46'er. I've only done about 35 and Gothics is one of them. That has to be one of my favorites. The cable is very memorable. When I lived in New York as a kid I used to go with my father to John's Brook Lodge on trail clearing trips with the ADK. We would clear the trails over the Wolfjaws, Big Slide, and Yard. I think there was a little mountain called Short Job as well. Anyway, John's Brook Lodge is a cool place, and the Great Range is beautiful. The story of the impromptu ceremony was terriffic and so typical of the friendliness of the folks you meet on the trails. Hi Lindsay, though I'm experimenting with Google maps - it is tough getting all of the trail data into a usable map. 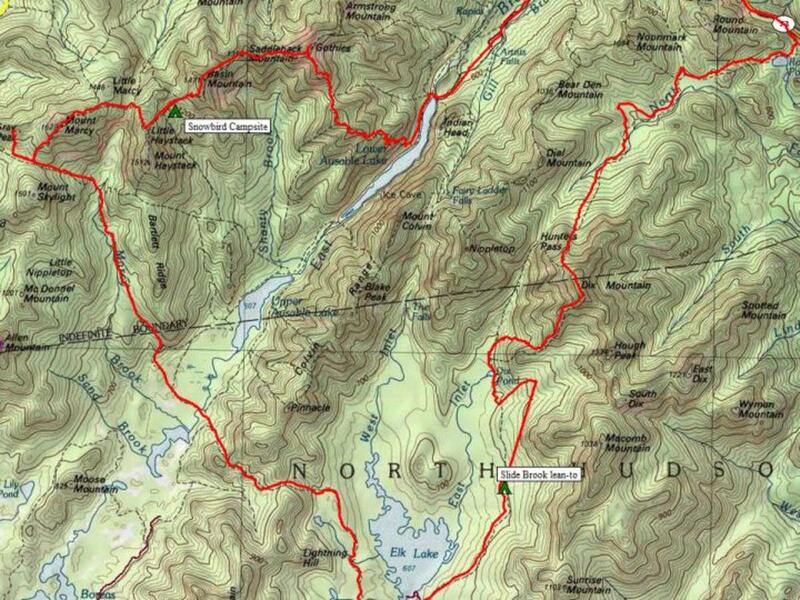 The above map, was just of my GPS tracks using the TOPO program from Nat Geo. If you are going to start backpacking in the 'Dacks there are two really good resources that I recommend. 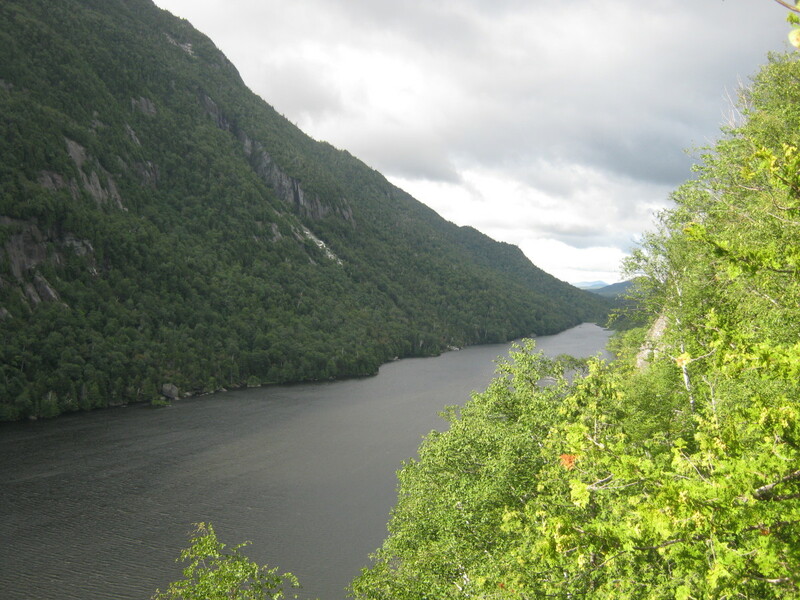 The first is the Adirondack Mountain Clubs High Peaks Region guide. The second is the National Geographic Trails Illustrated Map: Lake Placid / High Peaks - it includes trail distances and it is waterproof. These are my favorite resources and I linked to where you can check them out at Amazon up above. Thanks for reading - you can contact me through my profile page or any of my social networks if you have any questions. Could you post (or email me) a better version of your trail map? Your route looks really enjoyable and I'd like to give it a shot. I'm new to the Adirondacks (recently moving near Buffalo) and I'd like to give them a shot backpacking (I've done the climbing thing). I'm glad my tale was able to grip you a bit ktrapp. I always figured, what use is adventure if you don't share what you did. Sometimes, those little a-ha moments you discover on a trip may just click for someone else. Wow! What an amazing accomplishment. I am by no means a hiker, but I found the tale of your journey to peak #46 gripping. At first I was thinking what a life to be able to bask in one's passion, and then I was thinking, "this guys is crazy." I think the line about smearing yourself against rock made me feel that way. Your story is incredible. Your photos are breathtaking. And the makeshift ceremony for your feat was delightful. Congratulations. I didn't have much at all in my pack - not even a full length sleeping bag or pad. I flung everything before starting. Every time I get a patch, I fee like sewing it to my sash. Usually now, they just go in the "patch drawer." Thanks for the comment bankscottage! Great Hub and pictures! Your pack was 11 pounds! What, no salami? What happened to the coffee filters? Flung? You used the terminology perfectly CC. Of course the people on the more ambitious route only walked 2.5 miles from the parking lot - my starting point was a little farther away. I did feel like quite the zombie at the end of the hike. I was good for a few hamburgers and a couple of powerades afterwards. Well I had to do something crazy, right RubySoho? Hiking in all manner of weather, may be signs of a mental disorder. It just happens to be one of the good ones. The peaks do ice up quickly, I saw snow once in late August. Wright is an awesome peak and a great one to finish on. Congrats on the completing the 46 on the Dix - if I used the terminology correctly. :) Dang, the part about hiking 42 miles in 3 days has my head spinning. I think I would nearly die if I did that. That and the fact that you say that people in your group are more ambitious than you. Oh, geez. Then I must be a slug...I've only ever done 13 miles in one day. That was when I was younger. Not that I'm old...lord, I can't even think straight - I'm still awed that you can do all this in such a short time. :) Congrats again. Cheers! You are crazy! Good adventure though. I finished my 46 on weight peak. It must have been the first good icing of the year because there was a ranger just shy of the summit turning hikers back. When he heard some of our party was finishing 46 he said "I'm not going to convince you am I?" nope. It was snowing windy and miserable on top, but the champagne didn't freeze!